We are so pleased to announce, thanks to the generosity of an anonymous donor, KELT raised the final amount for our crowdfunding campaign to conserve farmland along Bowdoinham's Pork Point! Thank you to everyone that donated to the online campaign earlier this spring. The funds raised will go towards protecting and forever caring for these agricultural easements...keeping our local farms as farms! Farming has long been an essential part of the rural economy and way of life in Maine. Access to affordable, productive land has become increasingly difficult and expensive, especially for new farmers. In recent years, KELT has recognized the growing need to support local farming and other regional agriculture efforts. Access to fertile land is essential to local economies, however, in the next decade, almost 400,000 acres of farmland will change hands in Maine. Conservation projects, like the protection of Pork Point farmland, helps to ensure that this land will remain agriculturally active and affordable to working farmers forever. Bethany Allen & Eric Ferguson of Harvest Tide Organics (R) and Kathy & Pete Karonis of Fairwinds Farm (L) own the protected properties. Since 2013, KELT has been collaborating with fellow conservation partners, Maine Farmland Trust and state and federal agencies, to protect working agricultural fields and wildlife habitat on Pork Point in Bowdoinham. At 80 acres and stretching along the Kennebec and Abagadasett Rivers on Merrymeeting Bay, the land contains prime farmland soil types as identified by the U.S. Department of Agriculture Natural Resources Conservation Service. Including Winooski and Hadley Silt Loams, these deep rich soils are known as some of “the best agricultural soils in Maine.” They are key to the region’s high agricultural productivity and are critical to a farmer’s livelihood. The shorefront, an exemplary freshwater tidal marsh, is recognized as crucial habitat for tidal waterfowl and wading birds. Protecting this parcel would connect existing conserved lands. This creates a desirable, undeveloped block not only benefiting working farmers but also the existing wetland habitat and by extension the birds, fish, insects, and mammals that make Merrymeeting Bay their home. KELT hosted the campaign on a new crowdfunding platform, Conserve With Us. Created to connect people to conservation fundraising efforts and organizations in their communities, the platform provided KELT with a modern way to connect with people throughout Maine and the across the globe. Visit www.conservewith.us to learn more. 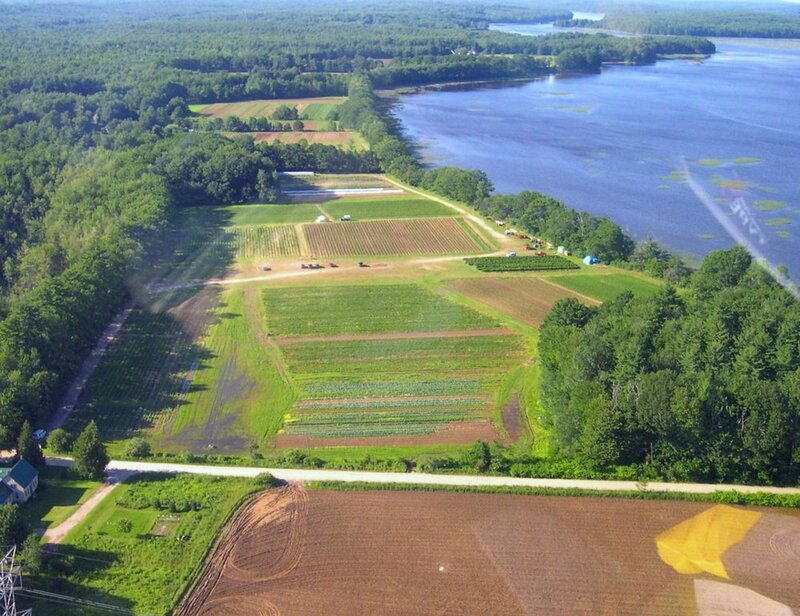 Aerial photo of the farmland on Pork Point. Fairwinds Farm photo.